Landscape Photographer of the Year 2018. 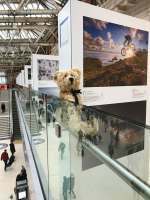 Landscape Photographer of the Year – Waterloo Station. Will Milner: The Daymark, Brixham, Devon, England. Richard Smith: Vertex, Telacre Lighthouse, North Wales. Leigh Dorey: Spring Greens, North Dorset, England. Justin Minns: Happisburgh Lighthouse, Norfolk, England. Mick Blakey: Fisherman on the Rocks in Strong Westerly Winds, Porth Nanven, Cornwall, England. Edd Allen: Collide, Newhaven, East Sussex, England. Marie Davey: Field of Red, Houghton, West Sussex, England. Robin Jones: Ash Tree in Old Sulehay Forest, Northamptonshire, England. Nicky Goodfellow: Beauty in Decay, Edinburgh, Scotland. Chris Gorman: Low Clouds Drift across Beachy Head, East Sussex, England. Jeff Overs: St Paul’s Cathedral crowned by the Blue ‘Super’ Moon of January 2018, London, England. This is Bobby’s favourite for the simple reason that he was there that night on Waterloo Bridge. There were a lot of photographers with very posh gear just waiting for the moon to pass behind the cross. There by chance, but not having the equipment anyway to capture the scene. Reading the description, the photographer still needed real skill to develop this image. And this Landscape Photographer exhibition is free! Starts at 2.24.00 in. Make sure you listen to the summing up by Duncan. This is iPlayer and only available for twenty eights days. Ha ha ha ha, it’s made his day! Thinking of Granny. And Diddley. A Year in the Life of a Bench.